It’s been a while. How’s it going? I’ll make this brief. There’s only a week left to donate to Movember. 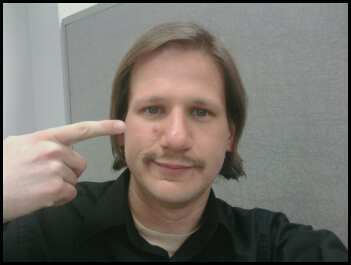 My moustache is a weapon against prostate and testicular cancer. I grow facial hair like a 14-year-old, AND now I have acne. Also, I’ve gotten a little behind on my writing. i missed a few days, and now I’m playing catch up. I CAN STILL FINISH IT ON TIME. And so can you, Yvonne. Jessica, I thik you’re out of luck. He said, “It sounds like its just sitting there, listening to the radio. Hold on…” honed in on the music that seemed to have lulled, or at least distracted, the demon.. “Something like ‘Waiting for the front door to splinter/ waiting all winter.’ Kind of nasal. Sounds alright.” If he survived this, he’s have to look up that line on the Internet. “Yeah…I can hear him breathing. It doesn’t sound natural. It’s all wheezy.” Fear began to take hold of him. His hands shook, his heart began to pound, and he became even more unsure of himself. “OK…go open the door.” Melissa said. Almost as a reflex, as if her authority made it better, he reached for the door. A few things ran though his mind, very quickly. Firs, he wondered if she had pushed him once again. Hequickly decided that this was not the case. The second thing was that Herman was in serious trouble; he had no way to defend himself, and if this all went pear-shaped, there was a good chance Herm wasn’t getting out alive. The third thing, as his hand touched the door knob, was that the demon was rushing at the door. Ben did not have time to warn anyone. He jumped back, levitating a foot off the ground as he did so. He knocked into Melissa, who also flew back from his momentum. Then, the door splintered and Simon stood there. He looked to be in bad shape. A large, blood caked gash showed on his throat, no doubt a remnant of his battle with Joe Milton. His skin had a grey pallor, as if he were dead. And he probably was, Ben realized. Which of course meant it would be harder to “kill” him. He quickly glanced over at Herman, who was just standing there by the check out counter, completely dumbfounded. That was not a good thing. He then glanced at Melissa, who seemed to also notice Herman. She looked back at Ben and nodded, getting up and readying her weapon. Finally, Ben looked back at Simon. Simon’s eyes were cloudy, and they did not seem to look at anything in particular. Ben though for a moment that perhaps this fight would be over sooner than expected, as it seemed that the host body was not much use to the demon. The bookshelf flying through the air told him otherwise. “Fu…look out!” Ben shouted, swinging his am out instinctively at the shelf. His arm connected, and the particle board and vinyl display shattered around him. He looked at his arm, surprised that it did not hurt him and that he, for once, seemed to have done something right besides his job. He looked at Simon, who did not look back. Ben decided that now was the time to step up. Lotepnatep was inside the host, so it stood to reason that hurting the body might hurt the demon. “Oh, that’s right! You heard the lady! We know who you are!” He said, diverting the demons attention. Then, he ran at it. Running towards the demon, he realized just how frail Simon Morrison looked, and suddenly, he felt sorry for the young man. He may have brought this on himself, but he surely did not deserve to be splattered all over the bookstore. He pulled his arm back, then plunged it forward, almost , but not quite, at full strength. His arm stopped short of the young man’s face. Simon had put his arms up, and though he did not actually touch Ben, Ben felt large, callous hands around his arm. Then, with a tug, Ben was pulled into the air. “Lleh ot uoy dnes llahs I! Em tseb ot epoh tonnac namuh latrom erem a! Q’alalth fo tnavres devoleb tsom eht ma I! Lotepnatep ma I!” Simon shouted, in his alien tongue. Then, he started punching the air in front of Ben, though Ben felt every explosive punch. “Ahhh! Help!” Ben cried out at no one, finally panicking. He was being beaten by the demon. Every invisible blow send shock waves of white hot pain though his entire body. He had never, in his entire life, felt pain like this. He looked down as his body began to fall lime. He looked into Simon’s eyes, which were now bright and full of unholy life. The young man was even smiling now. Tried to concentrate on the smiling face of young Morrison, focusing his head vision into a single point and pointing it at Simon’s face. To his surprise, the red dot that originated in his eyes ended short of the boy’s skull. Instead, the single laser dot hung in the air a foot away from Simon, who reacted by swinging his arms out and howling. He dropped Ben, who collapsed, trembling. He rolled and looked at Simon, right in his face, in hopes of channeling another red hot beam of energy at the man, but before he could muster the power to do so, something surprising happened. Ben turned his head and saw that Melissa had discharged the small canon she had been carrying. He had blown the host body’s head almost completely off. Blood and brain matter decorated the back wall of the bookstore. Ben scooted away from the gore. He heard Melissa shout “Take that, Fucker!” Unfortunately, it appeared that the demon was prepared to do just that. The host body, now headless, began to walk forwards, and Ben was hoisted into the air again, this time without warning from Simon’s limbs. Ben was ready this time, regardless of his ability to see the demon;s actions. He focused his heat vision again, this time straight down where he thought he demon’s arm would be. Before the demon could punch him, Ben made the creature drop him to the ground. He didn;t wast any time, From the ground, he jumped up and swung, this time connecting with Simon’s chest. He sis not pull his punch, and he felt the man’s ribcage splinter as his fist made contact. The man’s body flew into and through the back wall, into the storage area. Ben followed it, actually flying though the hole. He landed next to Simon and continued punching him, actually punching through him with a couple of blows. His final blow was to the student’s chest; Ben actually made contact with his heart, causing it to explode. There was no time to mourn, nor to celebrate. The air in the back room began to smell of sulfur and smoke. Ben backed up ad Melissa and Herman came though the wall to inspect the damage. The air became heavy, yet charged, as if there were a small electrical storm rolling through. In the corner, a shape began to manifest. Ben told the others to step back. The shape became solid. It stood in the dark, but Ben could see that it was the shape of a man, about six feet tall. He took another step back. The shape moved forward into the light. Ben wasn’t sure what the man was saying, but he was sure it wasn’t good. He flew at the man in an attempt to punch a hole though him as he had done to the host body. Before he could make it to him, however, his body became frozen in the air. The man spoke again. “Ai! Ai! Q’alalth liah! Q’alalth fo gnimoc eht ta elbmert llahs dlrow siht, noos dna, sworg rewop ym; siht wonk tub. Latrom erem a naht erom era uoy rof, uoy yortsed ot kaew oot ma I.” With that, the man vanished in a flash of fire. This entry was posted on 24 November 2009 at 11:57 am and is filed under Movember, NaNoWriMo, Writing. You can follow any responses to this entry through the RSS 2.0 feed. You can leave a response, or trackback from your own site.